I left the Big Lake Youth camp just before 6am. It was nice to wake up in a bunk house and not have to pack my tent and bag from scratch. Plus, I had an indoor bathroom. Oh, the luxuries! Anyway, I got an early start and the goal was to do as many miles as I could today without wearing myself out. I’d like to do at least 30mi/day the next three days to get me to Timberline Lodge at the time I have planned. Today’s trail pretty much sucked most of the day. 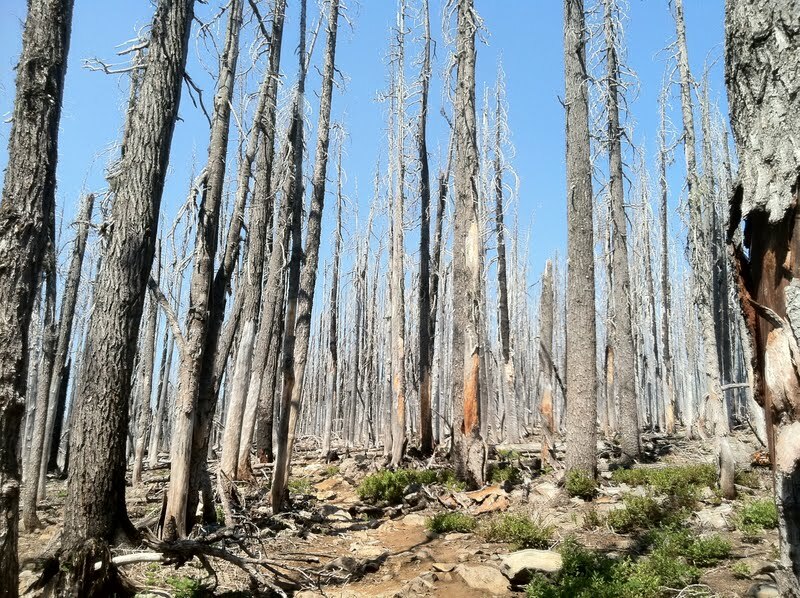 I usually don’t mind burn sections, but this is the second day in a row of uphill, fully exposed, dusty trail. It was not fun! Here is what I saw most of the day. If the pictures seem boring, try hiking in it all day! I think I would have tolerated it a lot better if I didn’t have the sun beating down on me. Have I mentioned I’m not a fan of the sun? It just made me really annoyed today. To add to it, I had to carry a fresh pack with five days of food. Oh yeah, and I had to carry more water because there was 18mi between water sources. I even played my freshly charged MP3 player for motivation and it played two songs and went out on me. Apparently, i left it on after charging it yesterday. Jeez! I was able to recharge it with my solar charger, but decided to save it for later on this stretch. I did get a couple good views though. 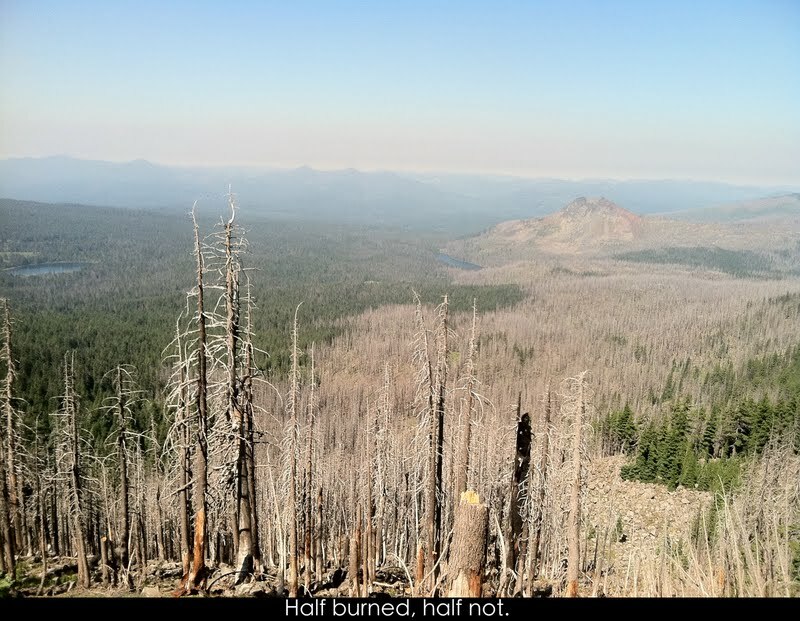 I should also mention that fires from lighting strikes and detours are quite common along the PCT in Oregon and we have been lucky so far this year. Just from the small thunderstorms the last couple of nights, I heard there were over 100 fires. My stepmom was flying over Oregon yesterday and said it looked pretty bad. It was hazy all day today and I don’t know I’d it’s from surrounding fires. The smell of smoke has been in the air the last couple of days too. 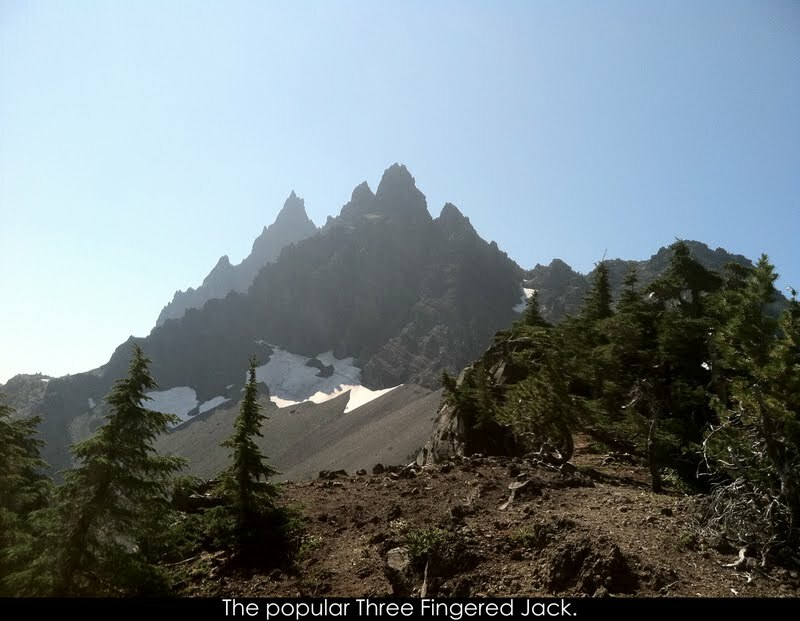 I didn’t see any other PCT hikers, but I did see and talk to a ton of section hikers and recreational backpackers going both north and southbound. Despite the difficult trail, I made really good time and was headed for a new personal record for miles in a day. 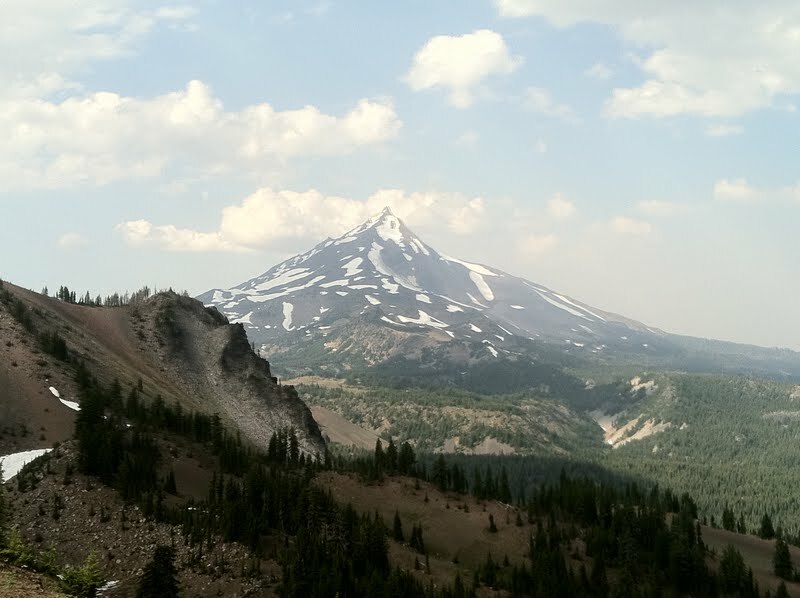 I had made it to the other side of the ridge with a nice wooded downhill…Then, around 6:30pm, the Oregon clouds suddenly rolled in out of nowhere. Where were they all day while I was hiking the burn section!? It got dark fast and the thunder rumbled as I practically ran down rocky switchbacks hoping to find an sheltered spot off the rocky trail to fit my tent. I was psyched when within 15mins, I found the perfect spot. I quickly set up and just as I got the tent up, the rain started. Whew! Of course it turned out to be a short drizzle on and off. All bark and no bite. Sheesh! So my personal record will have to be broken another day. 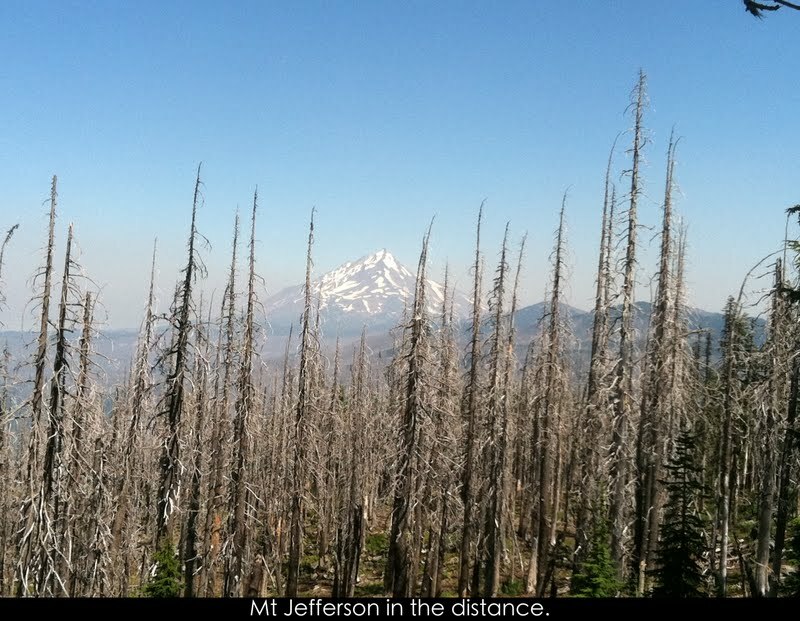 I’m looking forward to hiking in the Mt Jefferson area tomorrow. I’ve lived in Portland for two years and I’ve yet to get there, so tomorrow’s my chance!